Over the past couple of years Sony's VAIO range has produced some of the best multimedia laptops to date, and the AW series looks set to continue this trend. 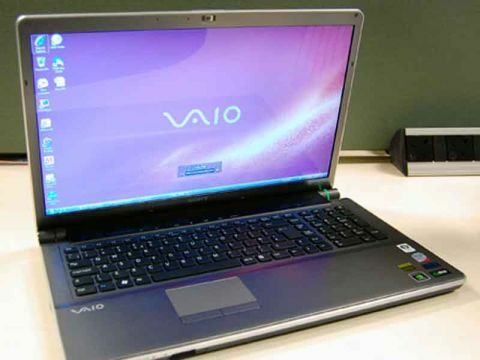 The VAIO AW is a replacement for the AR series, with prices ranging from £999 to £2499 (inc. VAT). The AW11M/H is the entry-level model, and we're one of the first places in the country to get one for review. The 18.4-inch screen is excellent – it's more than bright enough for use in sunny conditions, and colour reproduction is faultless. Our review sample featured a resolution of 1680 x 945 pixels, which isn't quite sharp enough to take full advantage of the high-def Blu-ray drive, but there's also an HDMI port for connecting an HD TV. High-end AWs boast a sharper resolution of 1920 x 1080 pixels, supporting full 1080p HD playback. While the AW11M/H used standard fluorescent tubes to light the display, those willing to spend more will benefit from LED backlighting, and it's the first laptop to use three separate coloured LEDs to offer even better, brighter colours. The display is backed by an nVidia GeForce 9300M GS graphics card, offering basic multimedia capabilities. Predictably, the specification is more impressive higher up the range, where a GeForce 9600M GT GPU lets you play games and edit videos with ease. The AW's keyboard is similar in style to all recent Sony VAIO's, with the keys protruding through individual holes in the chassis. This is the first time we've seen a dedicated numeric pad alongside as well, however, and usability proved excellent. In relation to regular laptops, the touchpad is huge, and offers an easy and accurate way of navigation. While our review model featured a traditional 300GB hard drive, top of the range AW's feature both 128GB flash drives and 500GB hard drives, offering fast access speeds and generous storage space.